Now, pricing is very much back to normal. If you head on over to the T-Mobile online store’s tablet section, the iPad Air is back up to $600 ($25 x 24) for the 16GB model and the iPad mini starts from $504. Nexus 7 is no longer sold, having strangely vanished from T-Mo’s online inventory a week or so back, as has the Samsung Galaxy Tab 2 10.1. The latter – presumably – has gone to make way for the Samsung Galaxy Note 10.1 coming in June. One piece of good news: The Galaxy Tab 3 remains at the low $199 pricing. With the pricing having gone back up, it’s fair to say this definitely wasn’t an official Un-carrier move. In interviews, press releases and blogs, T-Mo is keen to stress that Un-carrier phases are not short-term promotions, and are here to stay with the intent of changing the industry. This latest tablet promo clearly doesn’t fit in to those conditions, and has ended. It was an effort to get more customers buying tablets. Nothing more. Update: So, the iPad has gone up in price but it’s not quite full Apple retail cost. 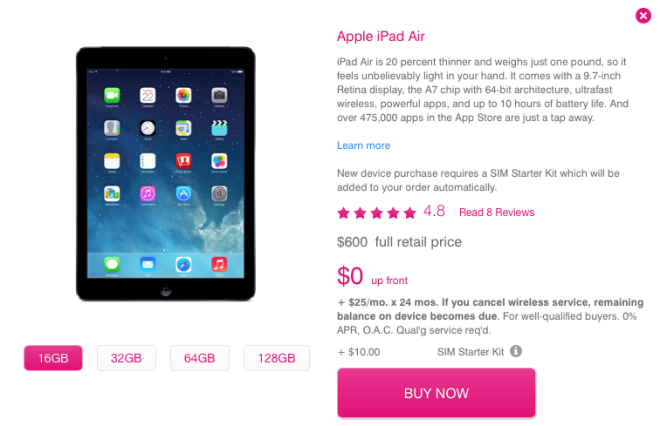 Apple – for instance – sells the 16GB iPad Air with LTE for $629. T-Mo, therefore, is $30 cheaper, just not quite the $498 price we’d seen before today. Also worth noting, that the offer to get the free data is still running until the end of this year. It’s just the iPad pricing that’s changed. I wish this had been a news story when it strangely vanished. I would have posted something, but I have no idea the exact time it stopped being sold. Apologies on that..
It’s probably for the best. The Nexus 8 is due out by July. If sales were strong, they would have extended the offer. I was going to definitely buy a Note 10.1 2014, Im hoping they maybe will still keep the promo on some tablets but this is definitely disappointing news. Didn’t realize this was a limited time offer. I thought the uncarrier movement with discounts were ongoing/permanent thing. I don’t think any company could take such a financial hit long term. $60-80 a tablet isn’t that hard of a hit, its the fact of no contract to guarantee profit off the data plan…. Another reason why i said this was stupid to begin with…. I dont know why u guys waited…But as soon as it went onsale I grab the mini ipad retina display right away! You cant beat the price for wifi model! I hope you guys learned your leason…lol Have a nice day! I myself am waiting for the next round of ipad’s and ipad mini’s coming out this fall. The price drops for this gens ipad mini retina should be bigger. And I could care less about the big touch ID and A8 processor upgrade that the next gen will undoubtedly tout. They called it an “Uncarrier Move”, which T-Mobile has said are permanent changes and not just short-term promos, so a lot of people were just waiting for new tablets. At the time of the announcement there wasn’t really any new shinies, so given that it was implied that this would be going on when the next Apple, LG, and Samsung tablets are released people decided to hold out. I wasn’t planning on getting a tablet either way, but it still kinda leaves a sour taste in my mouth. I’m cool with Legere trash talking the competition, but he needs to be careful not to contradict himself. Nothing is permanent. Don’t listen to the hype and marketing; buy what you want if it fits your needs and budget. Ignore the rest. Well they called this an Uncarrier Move, and didn’t have an end date on any of the promotional materials. Then, Legere proceeded to bash Sprint for only paying ETFs for a limited time, saying Uncarrier Moves are permanent changes. So I definitely find this hypocritical. Like I said before, this instance didn’t affect me, but it’s definitely making me more anxious of them 180ing on things that do interest me in the future. So what? “Uncarrier” will change, products and plans will change, prices will change. The only question is what will you do when it changes. Yes things change, but if they keep trying to act like their above the competition, then do the same thing, only worse (because they ended it with very little notice), it’s going to turn people off. A thriving Tmo is good for all of us. A Tmo where the CEO is openly caught in doublespeak is not good. I suppose the difference is that I don’t care about T-Mobile. T-Mobile is a company that provides products and services. I buy what I need from them. I don’t expect any more or any less. Everything else is hype. I do care about competition because that I am able to choose the products and services I need. And the best way to have competition is to participate in the marketplace by buying what I need. If you want them to provide better coverage and not get bought out by Sprint, which I do, then you’d want them to be successful. More revenue is the only way they can provide a better service to us existing customers. If I wanted better coverage, then I won’t have T-Mobile! T-Mobile’s finances are their problem. I really don’t care about their revenue. And T-Mobile does not care about you. It’s trying to make the most money for themselves and investors. Well there has to be some reason you’re even with T-Mobile in the first place. You’ve just said your opinion on coverage, so that’s ruled out. You do realize if Tmo gets driven out, the prices you enjoy could be a thing of the past? If you like what a company sells, it’s usually a good thing to hope the best for them. My only other guess would be that you don’t pay for your phone bill, so none of this really matters at all. And if that’s the case I’d have to ask why you even bother checking Tmonews? I’d like to believe in that, but how can we be so sure now? In his tweet he didn’t say “only Uncarrier X.0 Moves”. These 3 announcements were slated as Uncarrier Moves. This is just a really bad precedent. Was hoping it lasted long enough to get a newer Tab. Wanted the LTE Tab 4 but not at WiFi/LTE prices. Yep, I was planning on getting the Note 10.1 2014 too. What’s next ETF Credit reduced or rescinded? Starting to move backwards with this self created self promoted Uncarrier label…. I didn’t like the offer to begin with because it was pretty much going back to subsidizing equipment…. Next before last. first is not next. reduced, rescinded, reuse, recycle. backwards and forwards, connected together is life. Retail Store Associates were aware of this promotion ending this past weekend. They even took advantage of the deal before it ended. It’s unfortunate that none of TmoNews’s sources passed on the word. Hey man. I got sent a brief email yesterday, but nothing with any real specifics. No pricing. Hence why I posted it first thing this morning. I knew it was happening, just didn’t know what exactly, had to wait for the site to be updated. The plan for LTE tablets at wifi prices without making people also get or have T mobile phones wasn’t the best. All tablets are unlocked you could easily pay for the tablet for 1 month, cancel and switch to AT&T or Verizon. How would a tmobile tablet be compatible on Verizon’s network? Nexus 7 is, and the other ones work on att assuming they are unlocked. Every single model of the iPad at the very least work on every carrier in the country they are sold. I’m not sure about the nexus 7 or other android tablets but they should as well. Data runs on LTE, which runs on an interchangeable SIM card. LTE isn’t tied to CDMA or GSM… It’s LTE. So as long as a device supports the LTE band for the desired network, you’re golden. They should make a 2nd promotion where people have to have a T-Mobile phone in the future. Oh damn. I was wanting to upgrade my first gen LTE mini. Just paid off my 5S, too. Next payday was iPad day. Shouldn’t have fell for the Samjunk marketing. Only phones to buy are the Moto X, iPhone, HTC One and the Nexus 5. Yea some people are going to be disappointed about this but I’m pretty sure T-mobile rather upsets a few people over this as oppose to back track on paying off ETF’s which they said is forever or at least as long as DT owns them. I think DT’s CEO realizes it’s a good chance Sprint won’t be able to take over anytime soon and that they might not even announce a deal either anytime soon. ETF contract payouts and Tablet Freedom was a concept DT came up with remember people T-mo Usa is the teen child of DT and the idea is to get more people on the network on phone and tablet plans so they look more attractive for a buyout. Now, that that buyout is facing heavy FCC & DOJ scrutiny it might not even get announced so this money T-mo Usa has been loosing last two quarters Q4 $25 million and Q1 14 $100 million they need to get these numbers down moving back to a break even point in revenue. Yea Tmo probably should of clearly announced this as a promotional period but remember if it takes bringing cellular band tablets back to near retail prices for Tmo to cut down that money loss from 100 million to 50 million or less this quarter and makes stock prices go up and investors more satisified then the Uncarrier has to in this instance make a Carrier Move. Does nobody on the entire Internet know that it’s “could’ve”? Do you not know it’s anybody not nobody? Very unclear marketing on this promotion — most seem to have thought that it was part of “uncarrier” — therefore would stick around… or at least that it was tied to the free data until the end of year promotion — that is still around…. …and the cullular iPads didn’t go back to the full “normal” cellular rate, but they kept the Tab 3 at wifi pricing….so…. I hope offer is extended to Note 10.1 when it is released. I am glad I bought iPad Air 16 gb, I pretty much got it the day it was announced wifi tablet price, I said that’s extremely cheap, except I was a little dumb, at checkout I said is there other discounts ? The retail person said you just did! So I end up paying $468.00 which it includes my deposit, which I should get deposit by mid late next year ! Very happy with purchase! My internet fees till end of year!Awesome 1 GB! Plus the speed is at 48 mbps Download up load 16! in Fresno ca average!